Spectrum Surgical is a leader in partnering with healthcare facilities to provide educational programs and products that make patients safer. Spectrum Surgical Instruments Corp., a division of STERIS Corporation, is pleased to provide products for Surgical Instrument Education. Spectrum is a leader in partnering with healthcare facilities to provide educational programs and products that make patients safer. 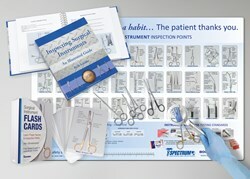 Product innovations such as Spectra-Mat™ Surgical Instrument Inspection Mat, Surgical Instrument Textbook, Inspecting Surgical Instruments; An Illustrated Guide, and Instrument Inspection and Identification Flash Cards assist with training and ongoing staff education. Learn the proper names and inspection points of common surgical instruments, sharpness test standards, instrument care and handling tips, enemies of surgical instruments, complete with full-color photographs and instrument identification guides. Contact a Spectrum Customer Care Representative at 800-444-5644 or visit the company’s website for more information about our surgical instrument educational programs and products.